Wells are used to extract water from the ground below as we all know. Nowadays, there are built in filters to sift out unwanted particles that could clog the pipe that leads from the water source to the well. But back in Abraham's time when these wells were built, I'm not so sure. The reason those wells needed to be re-excavated was that over the years, dirt and debris had filled them and water and could no longer flow freely in. 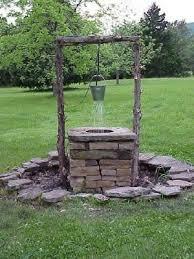 I think some of us are ancient wells, built without filters. We have allowed all kinds of sin particles to pass through and linger until we have become dry and barren. It's time to dig -- dig down as deep as we can go -- sort through all that dross -- till we find the Water source. And once we get there, we need to get our wells cleansed and purified, and build our filters so this doesn't happen again. If we're going to do this job right, unfortunately it won't be easy -- digging is hard work! But it will be well worth it! Let's get away with the Lord today. That's a number one priority. We need to get some time alone with Him. Fight for it if that's what you need to do. But we need it!! He wants to help us do the digging. He wants to break the strongholds of sin upon us. He wants to get that living water flowing through us again! Dear Lord, help us to dig down deep and clean out the things in our life that needs to be cleaned out. We ask You to assist us in digging out the things that are hindering us today. In the Name of Jesus, Amen.